The strong position of grammar as a component of teaching English as a foreign language continues to be supported by second language acquisition research findings and applied linguistics theory. Yet, the question how to teach grammar in the contemporary communicative language classroom still arouses controversy, although some open-ended solutions have been offered by the widely accepted focus-on-form approach. The present article attempts to provide a preliminary insight into the grammar teaching practices adopted by teachers in primary and middle schools. 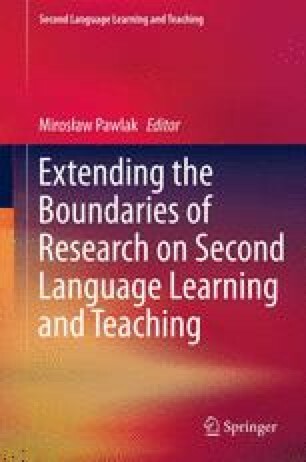 It describes and analyzes the findings of a study in which 42 lessons conducted by 18 different Polish teachers of EFL were observed with a special focus on how grammar was taught. Specifically, the following aspects of instruction were investigated: the contextualization of grammar presentation, the use of L2 and L1 in explanations, the learners’ involvement in discovery techniques, the level of meaningfulness of practice activities and the presence of learner interaction. The findings point to high levels of contextualization at the presentation stage, yet limited opportunities for meaningful interaction in subsequent stages. Moreover, extensive L1 use was observed during grammar teaching sessions. There is some correlation between the current trends in L2 grammar instruction literature and the teaching procedures observed in the study, but also some discrepancy, which may be explained by the teachers’ flexibility in interpreting trends and recommendations, as well as by their attempts to adjust their teaching procedures to suit a given educational context. Is the grammar point presented in context? Do the learners discover the rules by themselves? Is L2 used to explain grammar? Is the explanation technical, i.e. does it use metalanguage? Are the grammar activities meaningful to the students? Do they have any personal value? Do the learners have a chance to practice the structure in oral interactions? Is there pairwork and groupwork during grammar activities? Generally, is the grammar lesson enjoyable?